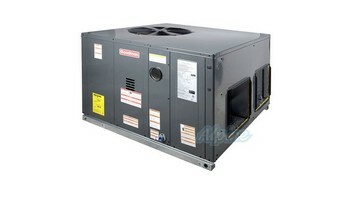 The GPC14M packaged air conditioner is covered by a 10-Year Parts Limited Warranty on all functional parts. For a full description of this product warranty, please review the consumer brochure or product warranty by clicking on the links above. This Packaged Air Conditioner provides energy-efficient cooling and heating performance in one self-contained unit. This unit is suitable for ground-level or rooftop installations. Goodman brand has concentrated on something more important than simple brand-recognition consumer advertising.They have focused on the design, engineering, and manufacture of dependable products that have helped millions and millions of homeowners achieve reliable, high-quality, and affordable indoor comfort. In addition, the Goodman brand has earned the loyalty and respect from thousands of local independent heating and cooling professionals across North America. They believe that your local HVAC (Heating, Ventilation and Air Conditioning) professional knows best about your specific indoor comfort needs and indoor air quality solutions. When the service technitions recommend a Goodman brand product, rest assured that you and your family will soon be receiving great indoor comfort, at a refreshingly affordable price. There’s a good reason why thousands of the nation’s HVAC professionals recommend the Goodman brand. Dealers are completely comfortable with Goodman brand products that will keep their customers satisfied and enhance their own reputation. Goodman brand manufacturing facilities are ISO 9001-certified, an independent standard accepted worldwide as the benchmark for quality manufacturing and management processes, and ISO 14001-certified, an international environmental certification. There’s a good reason why thousands of the nation’s HVAC professionals recommend the Goodman brand. Dealers are completely comfortable with Goodman brand products that will keep their customers satisfied and enhance their own reputation. Goodman brand manufacturing facilities are ISO 9001-certified, an independent standard accepted worldwide as the benchmark for quality manufacturing and management processes, and ISO 14001-certified, an international environmental certification. When it comes to recommending a brand for your cooling and heating needs, your local HVAC professional knows best. After all, they are the experts, the ones in the field who can accurately evaluate your specific needs and solutions. You may not know the brand of brake pads your trusted mechanic installed, but you trust your mechanic to make your vehicle perform the way it was meant to. Each HVAC installation is unique, and your local, independent HVAC professional knows which HVAC brands are best suited to your specific indoor comfort needs.